SOUTH ELGIN, IL (Sept. 15, 2016) – A new $475 inflatable packaging system from Sealed Air – the inventor of Bubble Wrap® and many other packaging solutions sold worldwide – provides a space-saving, cost-saving and environmentally friendly alternative to using polystyrene peanuts as void-fill and cushioning in packing boxes. The new Fill-Air® FLOW system makes protective air pillows affordable for users with low-volume shipping needs for the first time. Available exclusively in the U.S. from Millennium Packaging for less than half the price of similar products, the compact Fill-Air FLOW machine mounts to a wall or tabletop and produces 11 high-fill or 20 low-fill inflated plastic bags per minute. Both the machine’s 13″ x 14″ x 8″ footprint and the inflation speed are suited to environments with moderate shipping volumes such as retail shipping service centers, retail stores, e-tailers, light industry, company mail rooms, marketing and advertising agencies, printers, law firms, artists’ studios, art festivals and more. . Reduced storage space requirements – Each FLOW roll contains 500 10” x 8” ready-to-fill perforated bags in a spool not much larger than a roll of paper towels. A single roll produces fill volume equivalent to more than three-and-a-half 14-cubic-foot bags of packing peanuts, freeing up nearly 50 cubic feet of storage space per roll. Reduced packing material costs – At $50 per 500-bag roll, inflatable packaging with Fill-Air FLOW costs roughly $1 per cubic foot of fill compared to $1.30 to $1.90 per cubic foot for retail-priced peanuts. The refill rolls are also available exclusively from Millennium Packaging. Reduced shipping costs – The air pillows produced by the Fill-Air FLOW provide better cushioning in less space than loose fill, providing a shipping cost advantage for dimensional weight pricing that is based on the length, width and height of a package. Increased shipping protection – The air cushions also help prevent box contents from shifting in transit, providing better protection from damage or breakage than peanuts that get redistributed in response to package movement or vehicle vibrations. Easier environmental compliance – Polystyrene is not biodegradable and can harm wildlife when ingested, prompting bans in many cities and states including a recent ban in San Francisco that specifically includes packing peanuts. Inflatable packaging is more sustainable and can also be deflated and re-inflated for reuse. Operation of the Fill-Air FLOW is as simple as swiping a hand over a sensor located on the side of the unit for each bag desired, or holding a hand over the sensor for three seconds to inflate 100 bags at a time. High-fill or low-fill can also be selected with the touch of a button. 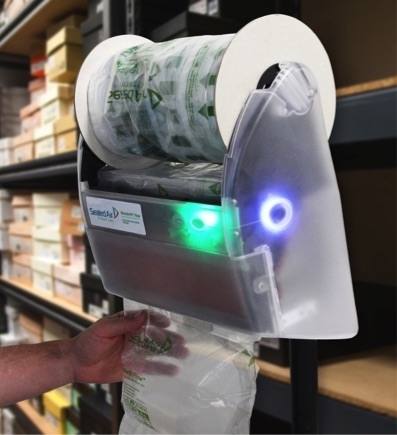 An optional photo sensor attachment for use with a continuous flow setting will stop production when it detects a set number of inflated bags and resume it when the bags are removed, making it possible to have bags ready for immediate use without inflating the whole roll at one time. For more information or to order the Fill-Air FLOW, visit www.parcelpkg.com.